1.) 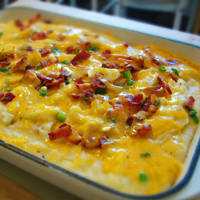 Stir the potatoes, 1 1/3 cups of the onions, peas, cheese and bacon in a 13x9x2 inch shallow baking dish. Stir the soup and milk in a small bowl and pour over the potato mixture. Cover the dish with foil. 2.) Bake at 350* for 30 minutes or until hot. Uncover the dish and stir the potato mixture. 3.) Sprinkle with the remaining onions. Bake for 5 minutes more or until the onions are golden.